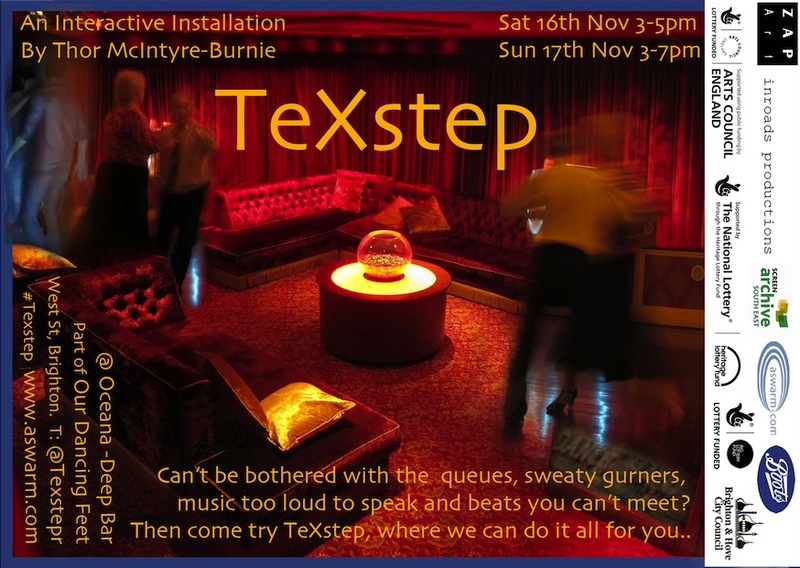 TeXstep – A new Commission Due to Happen : 16th & 17th Nov 2013. Taking the trajectory of social dancing from memories of Brighton’s Regents Music Hall to todays Oceana super-club, and beyond, TeXstep asks what would it be like if we didn’t have to be physically there? ..if we could out-source all the noisy, sweaty awkward, drink & drug fuelled bit and have someone do that for us. Taking inspiration from a comment made by a former regular of the Regent Dancehall in the 1950’s, Ken Ross, and Slovoj Zizek’s thoughts on the trajectory of Capitalism, the installation explores the nature of intimacy, touch, dance and bodily contact. However for me (Thor) the aim is not to judge, but instead to offer an alternate social dance scenario for us to explore. – One that slips times and spaces mixing memories with descriptions and predictions, and even live direct instructions. The results will be varied, funny, weird, detached and engaging, but the experience all the richer for having a go.. Come and enjoy the private suite.